Sharon Griffin has been writing since 2003. Her work has been published in professional journals such as "IDEA Fitness Journal," "Sports Medicine" and "Medicine and Science In Sports and Exercise," as well as online at My Food Diary and NEXSIS. Griffin holds a Ph.D. in exercise science/ physiology and a Master of Science in nutrition, both from the University of New Mexico. Red beans and rice is a nutrient-dense food, providing plenty of protein, fiber, vitamins and minerals relative to the amount of calories that it contains. 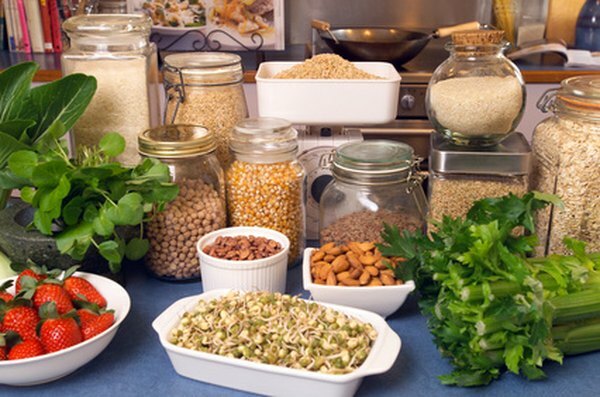 To get the most nutrient-packed meal, use brown rice and cook the beans from scratch to minimize sodium content. One cup of red beans and rice, mixed half and half, contains approximately 400 calories. One cup of red beans and brown rice mixed half and half has 80 grams of carbohydrates and 18 grams of fiber, which is about three-fourths of the 25 grams of fiber women should include as part of their daily diet. This large amount of fiber slows the entry of these healthy carbohydrates into the blood stream, thereby blunting any large insulin response. In addition, fiber increases satiety by making you feel fuller and it is linked with a reduction in cardiovascular disease, diabetes and colon cancer, as well. One cup of red beans and brown rice mixed half and half has 22 grams of protein, which is almost half of the 46 grams of protein women need each day. Rice and beans are thought of as complementary proteins, meaning that when eaten together they provide all the essential amino acids that your body can't make on its own. Thus even though rice is low in some amino acids and beans are low in others, eaten together their strengths complement each other, providing a complete protein. Red beans and rice is a very low fat food, containing only 2 grams of fat in every cup. Because of the high fiber content, however, it still tends to provide satiety without the fat. If some healthy fat is desired, olive oil can easily be added and will provide a nice flavor. Beans are a great source of B vitamins, folate, iron, magnesium and potassium. Brown rice is also full of B vitamins, manganese, magnesium and phosphorous, together making the mixture a powerhouse food. People often choose to eat cajun shrimp or sausage alongside this popular dish, which will provide a boost of protein to the meal. A vegetable dish is always a nice addition, as well, and vegetables will increase the fiber, potassium and vitamin A content of the red beans and rice meal.